SUBHEAD: Large landscape scale reforestation at Auwahi on Haleakala is proof. 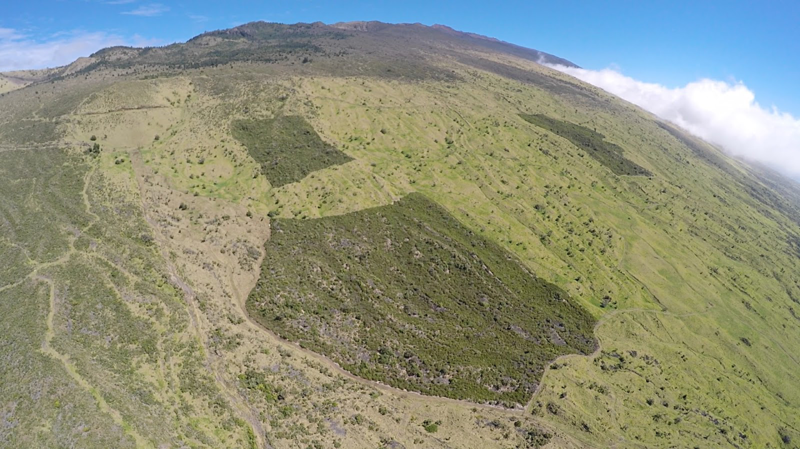 Image above: Southern flank of southwest Maui where Auwahi reforestation project is turning Haleakela green. From original article. Click to enlarge. When Art Medeiros fenced some Maui pasture that had a smattering of native dryland forest plants on it, most folks figured he was engaged in a pipe dream. He hoped that by excluding deer and cattle, and with a little loving care and some outplanting, something approaching a healthy native dryland forest could result. Medeiros was right. The image above is the proof. The three dark green patches are areas fenced to keep grazing animals out and then planted with dryland natives. The 10-acre center square was fenced and planted 20 years ago, the bottom 23 acres 12 years ago, and the 23-acre shape at the right eight years ago. Medeiros worked with the landowners, `Ulupalakua Ranch’s Erdman family, along with the U.S. Fish and Wildlife Service and the Natural Resources Conservation Service, to form the Auwahi Forest Restoration Project. You can learn more about it at this website. What they found is that landscape-scale conservation efforts work. It is a remarkable example, but certainly not the only example in Hawaii. When the Territory of Hawai`i removed feral cattle from the Koke`e grasslands on Kaua`i, those rolling acres of pasture were able to convert back to forest that is now Koke`e State Park. When George Munro on Lana`i fenced hundreds of acres at Kanepu`u a century ago to keep out deer and mouflon sheep, he protected a native forest that survives today. When Lida and David Burney took the analysis of ancient pollen samples at Makawehi on Kaua`i and planted those plants into a nearby former cane field, they restored something long gone from that landscape. Medeiros a few decades ago saw a few botanical gems in a severely degraded landscape. When he proposed trying to restore it, he got a lot of pushback. It was a dead forest standing, he was told - Degraded landscapes were inevitably going to further decline. At Auwahi, there were priceless old endemic trees, but they were not reproducing and had not reproduced for decades. The native species covered only 3 percent of the landscape. Why care? Native dryland forest is some of the rarest treasure in the Hawaiian realm. It has been displaced by development, agriculture, pasture and constant pressure from non-native predators on the natural landscape, like cattle, deer, goats, sheep, pigs and rats. Medeiros and his team fenced out the cattle and deer at Auwahi, starting with the 10-acre square they now call A-1. With the help of teams of community volunteers, teachers, canoe clubs and many others, they began planting out native species—more than 125,000 seedlings to date. The result: Native species cover in some areas is now 82 percent. “Near two-thirds of native tree species at Auwahi are now producing seedlings naturally, a sign of a healthy functioning ecosystem, including some species that had not done so in centuries,” Medeiros said. And on a dry slope of Haleakala, where much of the landscape is brown and yellow, here it is deep green. Not only an indication that the plants are back, but that the landscape is functioning as a watershed. Medeiros gives special credit to the landowners, Pardee and Sumner Erdman and their family, for their dedication to conservation, and their willingness to convert pasture to native forest—without compensation. “`Ulupalakua Ranch has...served largely as a silent and enthusiastic partner. In all my years in conservation, I have never seen another for-profit group act in this way,” he said. Donors to the project over the years included the Frost Family Foundation, Maui County Department of Water Supply, Hawai`i Community Foundation, Hawai`i Tourism Authority, Maui County Office of Economic Development and the Edward J Anderson Foundation.